The principles are simple. The execution, though, requires deep knowledge of the process and taking into account many parameters. 2KM, one of the leading names in processing systems is featured in an extensive article by the leading trade magazine Composites World. The comprehensive presentation gives all the reasons why the metering, mixing and dispensing systems are the only way forward. The need to meter, mix and then dispense lubricants, foams, paints, coatings and other fluid products has spawned a huge industry. In fact, equipment aimed at the composites industry is a very small part of the total meter/mix/dispense (MMD) market. That said, MMD has become a necessity throughout the business of composites fabrication. 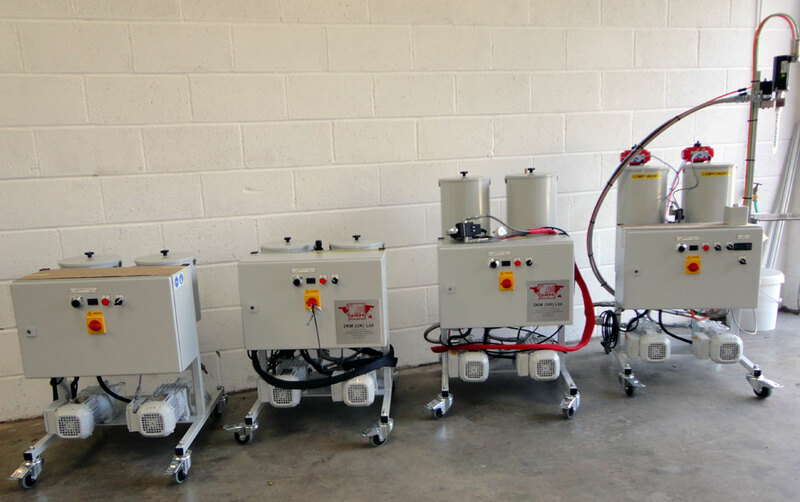 Moulders use MMD equipment to supply resin systems to gel-coating and spray up equipment, to inject them into pultrusion dies, to impregnate dry fibre in the filament winding process and to wet out layups and preforms in closed moulding processes. MMD also plays a key part in the production of many raw fibres and base resins used in composites. Polymers must be metered and mixed before they can be spun into a fibre, and resin manufacturers must meter and mix resins with additives. This highlights a recent trend in materials suppliers using MMD machines to avoid the cost and inflexibility of batch processing, both in mixing powdered additives (e.g., pigments, fire retardants and glass microspheres) and in prepregging. One of the biggest trends, however, is the use of MMD and robotics in adhesive application, in search of the perfect bondline, as OEMs move away from mechanical fasteners in search of greater speed and reduced cost. Meter/mix/dispense MMD systems are used with multicomponent resin systems. Two-component thermosets predominate: Part A (the resin) and part B (hardener for epoxies or catalyst for styrenated resins).That said, systems that require up to six components — pigments, fire retardants and other additives — are not uncommon. But all MMD systems perform essentially the same function: They meter out precise amounts of each component, mix them, and then dispense them via positive displacement, meaning material is dispensed either by moving a piston or rod or by rotating an auger or gear, onto a surface or into a mould. MMD equipment can be relatively simple. For example, in a fixed mix-ratio system, the metered volume may be determined by the displacement of the cylinder used for each component. The cylinders are mechanically linked and actuated by a pneumatic drive, with discrete volumes dispensed one at a time. More complex systems, however, can mix three or four components, and do so at variable mix ratios that can range as widely as 1:1 to 100:1. They may also draw components from 55-gal (208-liter) tanks or intermediate bulk containers (IBCs), also called “totes,” which commonly hold 275 or 330 gallons (1,041 or 1,249 litres). Material also can be drawn into pressure vessels. 2KM has a range of 45-liter to 10,000-liter (12-gal to 2,642-gal) capacity pressure vessels as material feed options for its Process GearMix 520 and 720 machines. On-board tanks are also an option, ranging in size from 1 litre (0.3 gal) for small R&D units to 60 litres (16 gal) and larger. These containers can be independently temperature controlled and vacuum degassed, and also can incorporate agitation to ensure homogenization. MMD systems can range from less than $10,000 to $600,000. Once the components are metered, they can be combined with one of three mixers. Dynamic mixers have a rotating blade inside a chamber and reportedly give the most complete mixing, but may require purging with solvent after process completion to expel residual mixed material. Static mixers feature nozzles that have no moving parts. Instead, their convoluted interior shapes divide and blend resin components thoroughly as they pass through. There are also removable types, inserted into pipes and hoses. Static-dynamic mixers are similar to static mixers but have a rotating element for hard-to-mix materials (see sixth image down at left), combining the higher mix energy of dynamic mixers with the disposability of static mix heads. recipes the purged material needs to be disposed which can cause issues with solvents and environmental standards compliance. Disposable static mixers have become very popular as the tube can be taken off and thrown away. In general, the industry prefers solvent free equipment, and disposables are an inexpensive alternative. MMD suppliers differ on the subject of what technology performs best. Many offer multiple types and tailor systems to customer’s needs. According to some, a gear pump has a limited operating range for providing a good flow rate. The flow rate usually varies with infusion and RTM, but if too slow, then pumping is inefficient. Here is where piston pumps are better, more suited to a wider range of injection rates and to maintaining constant pressure. Piston pumps fare better with fillers or particulates while gear pumps become too challenging to maintain when using abrasive additives. Another argument claims that since gear pumps have been around for 100 years they offer very steady flow, are made to very tight tolerances using high tool steel and can typically handle temperatures up to 700°F/371°C. Piston pumps have seals and O-rings whilst gear pumps offer a simpler, more compact design, with no O-rings or seals that wear, and thus, part replacement and maintenance are reduced. Gear pumps are very reliable, with no pulsation versus piston pumps for filled resins; gear pumps can use different gear profiles and designs — for example, helical gears. If the customer wants to process filled material, the specification can be designed into the system but there is a limitation to 40 percent filler by volume most of the time. Working with the gear pump suppliers to determine the correct specifications to accommodate fillers is essential. More often than not, piston pumps have a hard time with heavily filled materials, too. The packings, a type of seal, will go out very quickly, which becomes a maintenance problem. Piston pump proponents counter that for abrasion and wear from fillers, the answer could be a “ceramic pump,” so called because it features ceramic-coated steel in place of bare metal for the piston and sleeve. The ceramic coating has a Mohs scale hardness of 9— higher than silica, the raw material for most fillers. Accordingly, the pump surfaces exhibit significantly better abrasion resistance, but are also more expensive. There are other metal surface treatments that offer similar performance. Some prefer positive rod displacement for metering filled resins, claiming that it exhibits the least amount of friction and wear and the most accuracy in dispensed volume and mix ratio. The ceramic pump supporters point out that in gear pump and piston pump systems even if a small amount of wear occurs, the mix ratio accuracy can suffer. When MMD is used in composites moulding processes it involves resin injection or infusion. MMD supplier must focus not only on the MMD componentry but also on the details of controlling the whole infusion/injection moulding process. Whether using a gear or piston pump is not as important as maintaining the resin flow front through the volume of the mould. Many suppliers say the accuracy with which the MMD equipment dispenses material depends on the ability to balance the flow rate and the pressure in the mould. One way to achieve this balance is by using flow meters. In the same way that a car’s cruise control speeds up or slows down its motor to maintain overall vehicle speed, flow meters are used to control the flow coming out of metering pumps. Even very accurate rotary gear metering pumps will slip when encountering back pressure as the mould fills with resin. Mass flow meters sense the flow exiting each pump and, via the PLC, servo drive and rotary servo motor, increase the speed to overcome mould back pressure and push resin into the mould, or decrease the speed to prevent over pressuring of the mould. It does this for each of the components being mixed, continuously adjusting to keep the mix ratio intact. 1,200 scale divisions per inch, providing very accurate output. The devices feed data back to the machine controller, which calculates how much material has been dispensed. With the RTM process there is the need for controlled flow, but also the ability to limit pressure. If the pressure stays constant, toward the end of filling a mould, the built up pressure will separate the tool. The hydraulic, fixed ratio systems are programmable for constant flow rate or constant pressure. With HFR equipment, either flow or pressure can be the primary control, while the other is monitored and kept below a critical limit. For some closed moulding equipment however, the solution is its mould pressure guard. Designed for light resin transfer moulding (LRTM) and vacuum-assisted RTM (VARTM), these systems feature entirely pneumatic operation, with a control box and stroke counter. The guard’s function works as follows: at about 75 percent of the way to filling the mould, the injection pressure and the pressure at the resin flow front are very different. A pneumatic sensor is used in the LRTM mould and/or vacuum bag to sense the in mould pressure and communicate back to the machine control to slow the pump, shutting the flow valve and stopping the pump, if required. Most MMD suppliers, in fact, can design-in this type of emergency shut-off as well as alarms that indicate when pressure is too high or too low. All of this can be set as needed and settings can be stored in each process recipe. The injection process also can be defined in discrete steps. For example, an initially high flow rate can be followed by three to four reductions. Equipment with a similar capability can begin at a continuous flow rate, but then switch over to resin being drawn in with vacuum while maintaining the mould at a certain pressure, utilizing pressure transducers in the material lines. The machine will sense when the mould hits the operator-set threshold pressure and will automatically change pump speeds to control flow to maintain that pressure. In this case, the operator may want to vary that pressure if, for example, a mould features large, open sections and more closed, complex geometries. The flow would be fast at first, but then slow as the mould cavity gets tighter. On programmable MMD systems the operator can vary the pressure and also add that variation into the process recipe. Nevertheless, a thorough understanding of the process is required. It seems that meter/mix on demand is new to prepregging, but growing quickly. When prepreggers apply a thin film of resin to a 54-inch to 60-inch (1.4m to 1.5m) wide web of continuous fabric, the resin must be mixed and applied very accurately. The increased automation in the aircraft industry is considered as one driver for using MMD in prepregging lines. Suppliers are also making prepreg for wind turbines, sporting goods and automotive, and want to eliminate batch processing. Mixing batches of resin requires using slow-reacting resins to allow for laying a film. With inline MMD, prepreggers can go to faster-reacting resins. MMD equipment reportedly also cuts waste, ensures accuracy, reduces equipment size and boosts efficiency. Traditionally, large equipment would have been required to melt solid resins and apply them, but now it can be done with a much smaller footprint. A draw pump with heated platens melts the material right out of the barrel, eliminating preheating and the need for a second machine and traditional two-stage process. 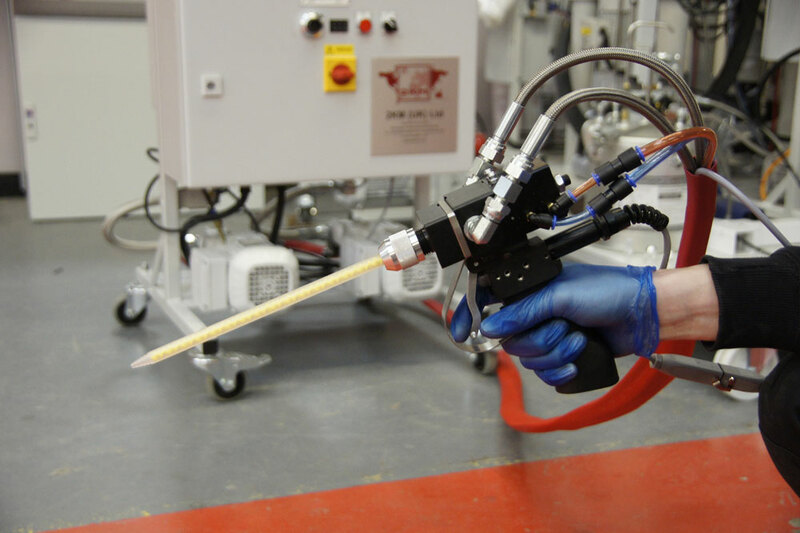 As manufacturers move to adhesive bonding to reduce the labour and cost of fasteners, it seems that MMD of methyl methacrylate (MMA) adhesives is a trend. MMAs are preferred because they reduce or eliminate the need for prebond surface preparation, which saves time and labour. Sanding and grinding can be eliminated because the chemistry actually etches into composites to provide a mechanical bond. To handle that aggressive chemistry, however, some MMD systems must feature stainless steel construction. MMA adhesives work better in piston machines and tend to dry out in MMD systems with gear pumps. Applications can range from gluing jets into fiberglass hot tubs to attaching a 40-ft/12m boat hull to its deck. In the latter case as the material hardens quickly, it required two machines to lay a 1-inch [25-mm] bead all the way around the hull and deck perimeter in time to mate the surfaces before the adhesive begins to gel. This is why machines dispensing MMA adhesives must have a high output. 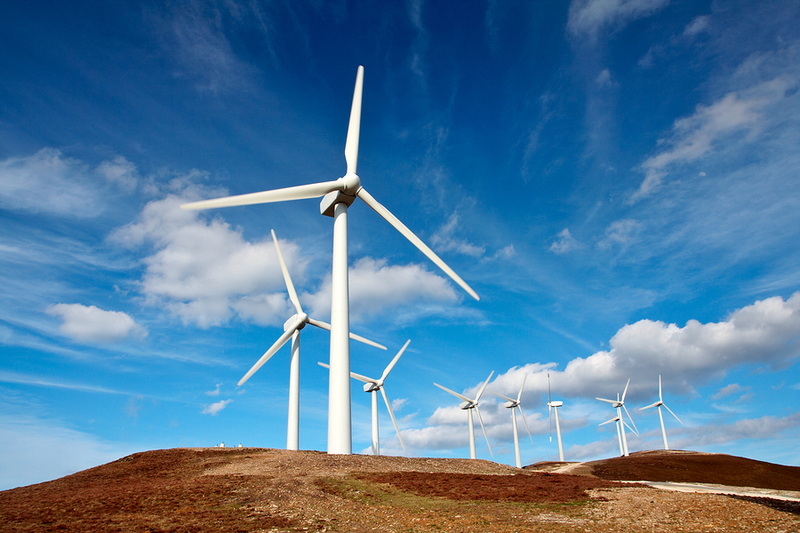 One of the biggest MMD applications is the bonding of wind blade halves. 2KM has responded to the larger blades for offshore turbines with the PolyMix 2000, a machine that is 2m/7 ft taller with a 5m/16-ft extension that can provide flow of 18 to 20 kg/min (44 lb/min) while maintaining precision in the mix ratio. Another “big” factor is that adhesives are expensive, prompting companies to seek cost savings by buying in bulk. MMD machines offer the ability to move away from pre-mixed cartridges, accurately mixing and dispensing bulk materials. Another recent trend in adhesives application is to mix powders with liquids on demand. Normally, this would be done in a bulk mix because the chemistries are very expensive and everyone wants the cheapest price possible. But now the manufacturers want to add fillers like glass beads inline vs. batch bulk processing, the relevant equipment has developed equipment. MMD suppliers assert that the increased use of carbon fibre in closed moulding has increased the use of high-performance resins. This means that MMD systems must also be capable of appropriate resin conditioning, such as heat and degassing. Heating is a key MMD parameter because, for epoxy and polyurethane, viscosities are temperature-dependent. As the viscosity changes, it changes the internal pressure throughout the setup, so the material needs to be kept at a constant temperature. This becomes especially critical if flow meters are not used and one has to rely on what is theoretically put through the pumps. If control the environment is controlled and temperature maintained from the start — in the tote or drum, for example — then the parts are more consistent. Heated systems help to stabilize the processing environment, especially in unheated plants where cold winter temperatures can increase resin viscosity and alter its reactivity. To achieve this, electrically heated vessels, valves, fittings, lines and hoses are available. The market offers thermal-electric and water-based heating technologies, both of which can heat and cool. Water heating systems show better wear resistance than electrical heating for automated systems where robotic operation causes a lot of hose movement. Cost is also a factor. Every inch of fluid in the system has to be controlled to be done correctly. Independently controlled ceramic-enclosed infrared (IR) heaters for each resin component’s compartment ensure that a separate temperature can is maintained for each. Multiple, independently controlled zones allow the user to keep temperatures relatively low in the bulk tanks, and then ramp them up as the resin moves toward the mould so that only the injected resin reaches the target temperature. If, for example, a 50-gal drum is heated to the full temperature, but only half of that material is used, not only is energy wasted but also the repeated heating to the higher temperature degrade the bulk resin and hardener over time. Degassing is often necessary, especially in polymer casting and RTM, to prevent air bubbles and moisture uptake. A resin with air in it is like a sponge for water. Without pre-degasing, one will have to degas as the resin enters and flows through the dry laminate stack. Vacuum degassing eliminates porosity, especially with fast cycle times. This function adds complexity to MMD equipment and isn’t always necessary and there is a lot of infusion being done without degassing. Where parts are thinner and more lightweight, though, the elimination of air voids becomes more critical, and parts manufacturers are looking to the MMD equipment to help. As companies refine resin infusion processing and work on more of the details there seems to be a growing demand for degassing. As wind blades get larger, especially for offshore wind turbines, larger equipment will be needed to handle the increased mould volumes. It is argued that it is not really possible to degas inline with wind blades or boat hulls and other big parts, because the very high resin throughput required by those processes does not allow the time needed to achieve full degassing. However, for applications with slower flow rates — such as medical devices and electronics — degassing is easily achieved in on-board tanks. Very large tanks can offer hours of continuous flow, but caution needs to be taken as the rate of degassing is affected by many factors, including viscosity. For some applications, degassing could be achieved with a flow rate of 20 litres/hr [5 gal/hr], where in others it might need to be 5 litres/hr [1 gal/hr]. 2KM has worked successfully with a customer to replace a traditional “infusion vessel,” which heated and batch-degassed the resin, to inline vacuum degassing and heating at flow rates from 1 to 60 litres/min (0.3 to 16 gal/min). The ResinMix equipment feeds resin directly from a drum to a flow-through heater to reduce viscosity, then breaks the stream into small droplets in an evacuated chamber to remove the air and, finally, supplies degassed resin to the metering system. Most companies that do infusion only degas the resin component, but some in Europe now degas the hardener as well. MMD suppliers say the need for control can only increase in the future. As the industry has matured, moulders are beginning to realize that it takes far more precision than earlier thought to gain the needed control over quality and material cost. Although electronics and PLC control have increased MMD efficiency, composites production is still too slow to compete with injection moulding. Most suppliers, however, anticipate additional challenges and opportunities as new composite materials and end uses come into view. Material manufacturers see a trend toward nanoparticle and nanofiber additives. As these materials are added to production resins, moulders will demand new types of MMD equipment to prevent, for example, the entanglement of nanofibers during mixing. Among new markets, civil engineering will be huge for composites as just the sheer size of the surfaces will place new demands on MMD equipment. Many companies are getting very sophisticated and specific in what they need and it is up to the MMD equipment providers to come as close as possible to giving them everything on their wish list.